Often linked to the works of early Romanticism, Sophie Cottin's Malvina (1803) was a bestselling sentimental novel. First published in France, the English translation by Elizabeth Gunning – a prolific novelist in her own right – allowed Cottin’s book to achieve success internationally. This is the first modern scholarly edition of Malvina. "The present volume is a welcome addition to scholarship on Cottin, and it will no doubt stimulate further research on an important yet overlooked author. (…) Kaplan demonstrates her unparalleled skills as editor and scholar, her thorough knowledge of Cottin's life and works, and her expertise in eighteenth-century novels, especially those by women." 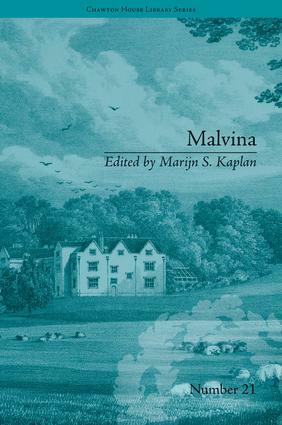 "Edited by Marijn S. Kaplan, Malvina is a welcome addition to the ongoing Chawton House Library Series: Women’s Novels. (…) Malvina will be of great interest to scholars working on tracing the transnational connections between women writers as well as those inter ested in literary adaptations and Scottish literature"